Cherrie L Moraga was born in Whittier, California. 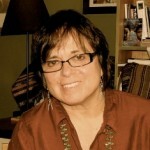 She is an American Chicana writer, feminist activist, poet, essayist and playwright. She is part of the faculty at Stanford University in the Department of Drama and Comparative Studies in Race and Ethnicity. Her works explore the ways in which gender, sexuality and race intersect in the lives of women of color. She graduated in 1974 earning a Bachelor's Degree in English. Soon after attending Immaculate Heart College, she enrolled in a writing class at the Women's Building and produced her first lesbian poems. She earned her Master's Degree in Feminist Writings from San Francisco State University in 1980. She is perhaps best known for co-editing, with Gloria Anzaldúa, the anthology of feminist thought This Bridge Called My Back: Writings by Radical Women of Color in 1981; which was one of her most successful books that won the Before Columbus Foundation American Book Award in 1986. Her play Giving up the Ghost, published in 1986, focuses mainly on Chicana lesbianism and the main heroine embracing her lesbianism rather than denying it. She published A Xicana Codex of Changing Consciousness: Writings, 2000-2010, in 2011. Her play New Fire: To Put Things Right Again had its world premiere January 11–29, 2012, in San Francisco, California.